Tourists in Cancun, Mexico are benefiting from an alternative to lengthy and muggy bus rides, care of two new passenger ferry sisters. 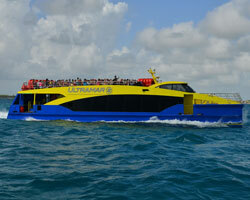 The aluminium newbuilds, christened City Jet 1 and City Jet 2, were designed by Australia’s Incat Crowther, constructed by Louisiana, US-based builder Midship Marine and delivered to Cancun fast ferry operator Ultramar. The vessels will provide frequent crossings of an enclosed lagoon; reportedly, the introduction of this ferry service will reduce travel times by 70%, compared to making the journey by road. Each City Jet features an overall length of 28m (or 27.7m lwl), an overall breadth of 7.5m and a depth of 2m, and has been designed to draw 0.95m. This design boasts the capacity for two members of crew and 300 passengers. Up to 118 passengers can access seating in the main deck cabin, which is accessible via sliding doors at both forward and aft ends, while 140 external seats are affixed to the roof deck. Extra standing room is located at the aft of the main deck, in addition to bathroom facilities and a luggage storage area. A raised engine hatch at the aft, meanwhile, is intended to increase maintenance space in the engine room. For rapid embarkation/disembarkation, hinged boarding ramps have been fitted at both ends of each ferry. Other onboard capacities include 2,000litres of fuel oil, 250litres of fresh water and 1,000litres of wastewater per ferry. Each vessel has been fitted with a pair of propellers, driven by twin Yanmar 6HYM-WET engines, rated 441kW at 2,100rpm apiece. This arrangement produces a service speed of 22knots at 85% MCR, increasing to 25knots max. The City Jet twins represent the first deliveries in a six-vessel order placed by Ultramar.